Green Thermal Energy CO2/Hydrocarbon Refrigeration provides a specialist support service to their customer base, which is designed to assist the CO2/Hydrocarbon Refrigeration specifier or installer in maximising the fast developing opportunity within the natural refrigerant sector. We understand that providing high quality equipment is only half of the package which is why the Green Thermal Energy Approved Partner Programme (APP) has been developed over the past two and a half years in order to provide the specifier or installer with the complete CO2/Hydrocarbon Refrigeration support service. Sign up to the Green Themal Energy, Industry leading C02/Hydrocarbon partner program. A partner program that will support you with an indepth specialist industry knowledge on all aspects of C02 and Hydrocarbon refrigeration an cooling systems. Green Thermal Energy operates a best practice approach to equipment specification, system design and CO2/Hydrocarbon system application. Therefore to promote this approach a new training schedule has been implemented which is geared towards providing the specifier/installer with the knowledge and resources to approach CO2/Hydrocarbon cooling and heating applications with confidence. The best practice CO2/Hydrocarbon module is based around system design & equipment selection and is a practical approach to product training which provides Green Thermal Energy partners with the necessary skills to correctly specify the range of CO2/Hydrocarbon Refrigeration equipment. This provides current and up to date information that will assist them in developing their business and minimising risk. This training in association with the after sales team provides specifiers & installers with specific knowledge relating to the Green Thermal Energy range of equipment which will enable the specifier/system designer and installer to competently select the correct system. Training can be provided at a site survey or project meeting which allows the partner to gain information on a specific real time basis. This proves to be a very effective form of training allowing the partner to discuss the particular application on a one to one basis with the Green Thermal Energy Applications Engineer. Please contact us to discuss any specific projects that require field support training. 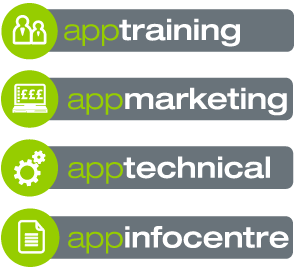 A flexible range of informal training modules are offered under the Green Thermal Energy APP, these training modules are suitable for either sales or technical personnel and can be tailored to match the demands and requirements of the partner. Providing an extremely cost effective means of gaining information and knowledge, this programme can be delivered throughout the UK with timescales dependent on group size. Please contact us to discuss your own organisations requirements. Green Thermal Energy offer a fully branded CO2/Hydrocarbon Refrigeration website which provides partners with a complete and fully functional method of delivering heat pump information to new and existing customers. The brand is recognised on a number of levels as a leading and innovative manufacturer of residential and commercial products. As a result of this brand recognition partners benefit from the trusted and quality reputation that the mark carries on both consumer and business to business level. Green Thermal Energy place a great deal of importance on developing awareness of CO2/Hydrocarbons refrigeration and as such carry out a number of initiatives on annual basis, therefore the partner can be assured they are working alongside one of the leading manufacturers who will provide support to local and national marketing initiatives. As you would expect a complete range of technical sales literature is provided to cover the different ranges of residential and commercial CO2/Hydrocarbon Refrigeration. Partner branded technical data sheets are available covering the complete range of CO2/Hydrocarbon Refrigeration and ancillary equipment. The Green Thermal Energy APP provides a range of cost effective and well thought out marketing support tools. The quality of the Green Thermal Energy range of CO2/Hydrocarbon Refrigeration products and services is emphasised, creating brand recognition. Technical and application support is a critical element of the Green Thermal Energy operation and is an area which is given the highest priority. The dedicated team of CO2/Hydrocarbon Refrigeration specialists provides both telephone and field base support as required. The majority of questions asked by Green Thermal Energy partners can be dealt with via our technical support desk which is manned by experienced engineers who have hands on knowledge of both the equipment and applications. You can be sure that your enquiry or query will be dealt with as a priority until the correct solutions is highlighted and the situation is dealt with appropriately. Green Thermal Energy have many years experience in providing service and technical support throughout the UK and Ireland. We have a team of experienced CO2/Hydrocarbon technicians who are able to provide commissioning and maintenance support to either commercial or industrial equipment. In addition, our CO2/Hydrocarbon Refrigeration technical specialists are able to provide advice and are available to attend pre installation project meetings or subsequent site meetings as demanded by the particular application. 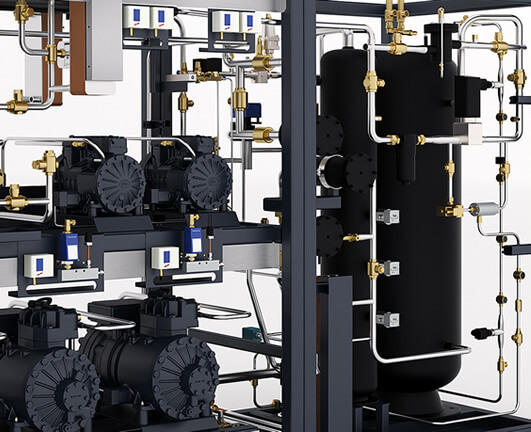 CO2/HYDROCARBON SYSTEM SPECIFICATION AND INSTALLATION MADE EASY, WITH AN EXTENSIVE IN-HOUSE AND NATIONAL APPLICATION AND TECHNICAL SUPPORT STRUCTURE. We are able to provide factory visits to support larger projects. These can be to facilitate either pre specification equipment demonstrations, progress meetings to confirm specification or pre delivery witness testing. All our equipment is European manufactured and a factory visit can take place over either one or two days with minimal travelling time (approx.1-2 hours) from the arrival airport to the factory. We are also able to provide our manufacturing and quality engineers to support client/project meetings if necessary throughout the UK. Green Thermal Energy provide the award wining partner hub to all APP registered users. The partner hub provides a complete access point for all application, specification, equipment and associated information on a 24/7 basis. The hub will provide you with many standard technical and sales documents but importantly also providing you with application and specification tools to assist you in producing quotations and/or specifications within commercial or industrial markets. contact us for your unique password and log in details. Demand for CO2/Hydrocarbon Refrigeration information can be viewed as an opportunity and the Green Thermal Energy CO2 CPD provides an ideal way for the Green Cooling Partner to deliver up to date CO2/Hydrocarbon Refrigeration information to their customers in the most cost effective manner. Delivering CPD material is an ideal way to communicate with potential clients. The CPD presentation is easy to deliver and is presented with a Green Thermal Energy applications engineer in the first instance to give the partner an understanding of the CPD format. The Green Thermal Energy CO2/Hydrocarbon Refrigeration website incorporates a blog which is updated regularly with any relevant industry information which will potentially provide useful updates to the partner and their organisation.